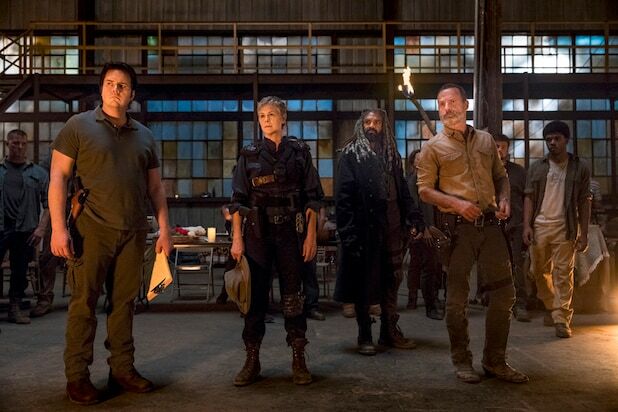 “The Walking Dead” Season 9 premiere is inching closer, and we’re passing the weeks by obsessing over every detail we know so far about the next installment of the AMC zombie drama series. Last month’s San Diego Comic-Con revealed several new cast members — including “The 100” star Nadia Hilker as Magna and Samantha Morton as Alpha — and leading man Andrew Lincoln saying goodbye, among plenty of other tidbits. So let’s dive right in, shall we? We knew that Lincoln would be leaving after Season 9 (TheWrap reported his exit in May), but both “TWD” creator Robert Kirkman and Lincoln himself spoke about his exit for the first time at the pop culture gathering. But what does a Rick-less “Walking Dead” look like? We don’t know how or even if Rick will die or be written out some other way, but the Season 9 trailer released at Comic-Con gives some clues to the beginning of the end of Rick’s road on the series. First, the trailer picks up after the time jump that takes place in the comics, with Rick and an imprisoned Negan having a chat. We also get a shot of Maggie (who has finally had her baby) looking out over the Hilltop, which has some new additions that seem to be made from the blueprints Georgie gave her at the end of Season 8. Notably, the new windmill appears to say “Commonwealth” — the community that is led by a woman named Pamela in the comics (many fans theorize that Georgie is from the Commonwealth and acts as the show’s version of Pamela). As the Season 9 key art also teases, the trailer takes our group to Washington, D.C., where we can see a crumbling Capitol building. Recently released Season 9 photos help paint that apocalyptic picture. The trailer shows a camp that’s made up of Alexandrians, Sanctuary members and Saviors alike. There’s a signpost in the middle that points to HQ, Oceanside, Alexandria, the Sanctuary and Toledo. There’s no Hilltop on that list, so some fans are guessing that HQ is the new name for the Hilltop. One thing that fans have been waiting to find out is whether or not the Whisperers will be part of Season 9. The Whisperers are a group that show up in the comics after the All Out War storyline and wear the skin of zombies to blend in and avoid walkers’ attention (similar to Rick and Glenn rubbing zombie guts and blood on themselves way back in Season 1). Those antagonists can be expected in Season 9, now that Morton has been cast as the group’s leader, Alpha (she first arrives in the books in Issue 132). TheWrap exclusively reported that “Sons of Anarchy” star Ryan Hurst will play Beta, Alpha’s second-in-command. Cassady McClincy will play Lydia, Alpha’s daughter, who in the comics is a love interest to Carl (Chandler Riggs). The Whisperers aren’t the only new group from the comics that we’ll meet in the show. Magna, played by Hilker, and her crew have also been cast: Broadway actress Lauren Ridloff will play Connie and “Wonder Woman” actress Eleanor Matsuura will play Yumiko. Other new cast members include Angel Theory, who will play Connie’s alert and protective sister Kelly; Zach McGowan as the “hostile” Savior Justin; Rhys Coiro as the “rebellious” Savior Jed; Brett Butler as the “salt-of-the-earth resident at Hilltop” Tammy Rose; and John Finn, who will play the Hilltop’s blacksmith and Tammy Rose’s “devoted husband” Earl. Those character descriptions alone hint at unrest when the communities come together. New Season 9 showrunner Angela Kang told TheWrap in an interview ahead of Comic-Con that this season will see nature begin to take over. Kang has also said that this season will highlight the women’s stories. Of Jadis — whose real name, we learned, is Ann — Kang said we’ll see her “in a way that people will be very surprised.” It will be interesting to see that play out, especially because of that shot of her and the helicopter in the trailer. Could the chopper be from the Commonwealth? It will also be interesting to see where Maggie ends up by the end of the season. Cohan will be exiting the show after Season 9 like Lincoln, but Kang promised in an interview with the Hollywood Reporter that Maggie won’t die this season. “With Lauren, she has said that she would like to come back to the show and we would love to have her back; we think there’s more story with Maggie to tell. We already have some plans brewing that I think are pretty cool,” Kang said. 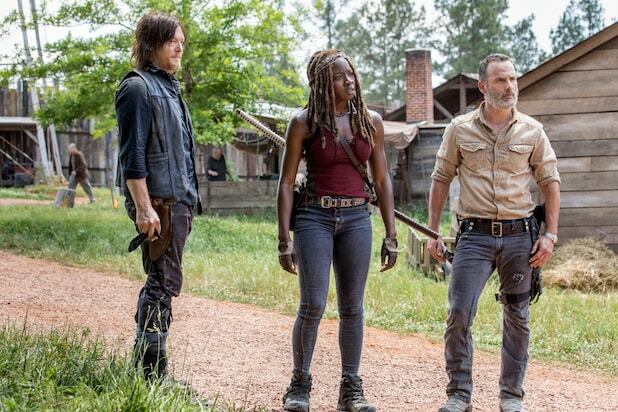 Also Read: State of AMC's 'Walking Dead' Franchise: Zombie or Still a Hero? TheWrap will keep you updated right here with anything else we learn about Season 9 before the premiere. In the meantime, we’ll probably be watching that trailer again and again. “The Walking Dead” returns to AMC for Season 9 on Oct. 7.